Jesus said to His disciples “Freely have you received; freely give” (Matthew 10:8). Outreach is all about sharing with others the abundant love that we have received from our Lord. That’s what’s happening when the Anglican Church Women make dresses for young girls around the world. That’s what happens when we gather items and prepare “care bags” for kids at Fresno Rescue Mission, where some of our parishioners also serve as volunteers. Or when our youth sort food and pack meals at the Fresno Community Food Bank. Or when we collect non-perishable food for Evangel Home, an organization here in Fresno which we have partnered with for many years, and continue to support financially as well. Last Christmas, members of the Saint Columba family came together again to provide gifts for children at both Evangel Home and our sister parish, St. Martin of Tours. Other past projects have included stuffing children’s backpacks for distribution to St. Martins, and partnering with Amistad Christiana, a congregation in Goshen, where youth and adults from Saint Columba teamed up to build a porch, sidewalk, and new access doors. Sometimes ministry is as simple as opening our doors: we have a long history of support for AA, and large “meeting” currently fills the Community Room at Saint Columba every weekday morning from 7:00-8:00 am. Outreach starts in our own neighborhood and city, but it doesn’t stop there. 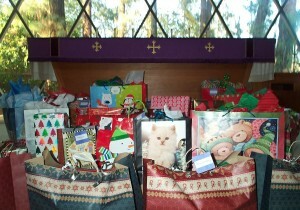 Each December, the Anglican Church Women put on a “Festival of Trees” and raise funds for ministry. These funds have been used to support Hope Now for Youth, a local outreach to gang members; church-planting in Los Angeles; and training for church leaders in Laos. As a congregation we also provide ongoing support for theological education here in the US. And in cooperation with our diocese we give annually to support our missionaries in the Middle East. What is our Savior asking you to do? How can you share His love? Come join us. Show forth the Kingdom of our God. And live in the abundant joy of that Kingdom.